a 'Fast, Cheap & Easy' project... and you won't believe what it is! for the porch decor at one of our client's Seattle area homes. a standard rubber bathroom plunger. I DO suggest that you get a NEW plunger from a home supply store for this! Look at it from the BOTTOM UP ! which is stuck to the floor of your entryway, porch, etc. #1: First you stick the plunger to the floor - in your entryway, on your porch, wherever. It won't stick to concrete, though, unless the concrete is really smooth. If you have an extra doormat, flip it over and expose the rubbery side - the plunger will stick to that! a five-gallon paint bucket wrapped in burlap, a metal milk can, anything that the plunger will stick to! so that the plunger's handle will go through the pants. 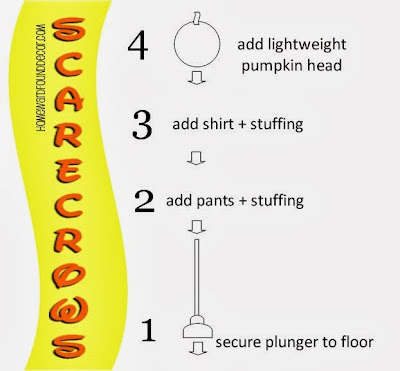 If you want the scarecrow to stand up, just slip one leg of the pants over the plunger handle. Close the ends of the pantlegs with a rubber band, and cover with raffia. Then stuff the pants - I use plastic grocery bags or trash bags. Stuff them REALLY full, making the pants as firm as possible - not squishy. with the handle coming up through the neck of the shirt. Close the ends of the sleeves with rubber bands, and cover with raffia. Tuck the bottom of the shirt into the pants - use straight or safety pins to hold them together. Add a raffia 'belt' in the pant belt loops if you'd like. again, stuffing it VERY full so that it is firm and not squishy. and DUCT TAPE it onto the plunger handle - this will help to hold the shirt and pants upright. Leave about 4 inches of the handle at the top for the pumpkin head to fit onto. a plush pumpkin, or even a Sweater Pumpkin! Put a hole in the center of the bottom of it. Then slide the pumpkin onto the plunger handle and snug it down to the neck of the shirt. and a hat to the top of the pumpkin if you wish. You could also use children's Halloween costumes for this project! 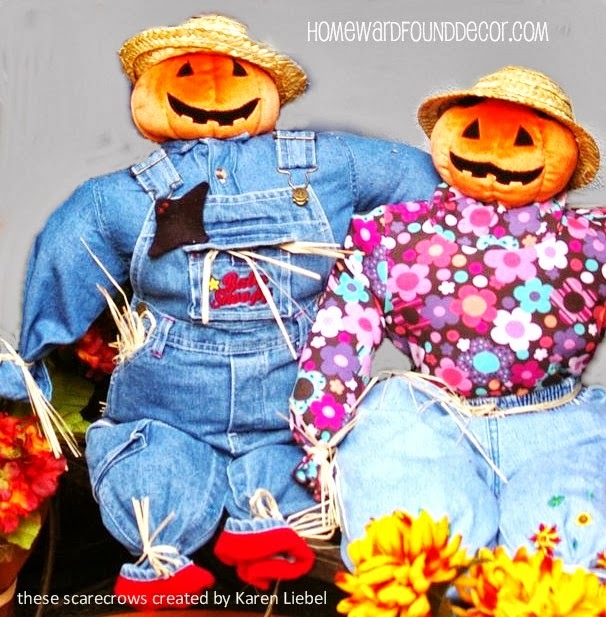 Try some from the thrift store, or maybe even use the costumes that your kids have worn in past years! [If , like me, you kept them because they were just too darned cute to part with. 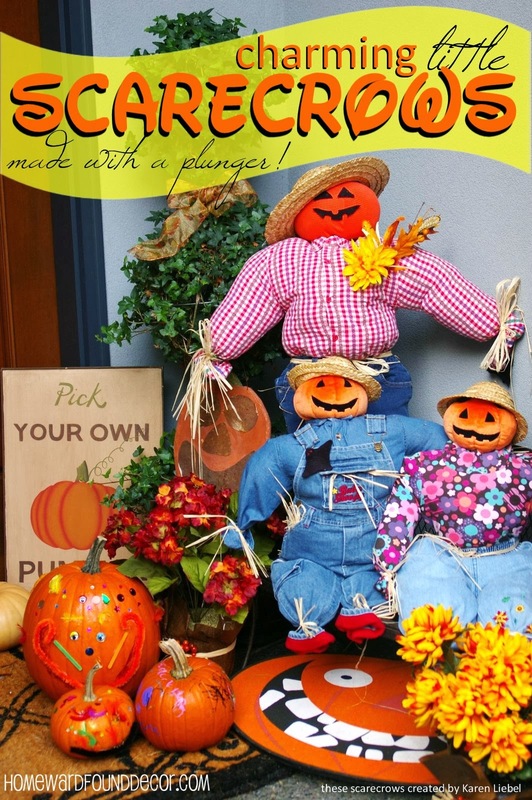 with a gathering of little costumed 'Trick or Treater' Scarecrows!